So what'd everyone do last week? Oh, that's nice. While we were twiddling about, a number of enterprising game developers made a bunch of first-person shooters. The event was called 7DFPS: a game development jam in the spirit of Ludum Dare, it challenges folks to cobble together something like a first-person shooter in the span of seven days. It ended this weekend--you can sift through the contributions at the game jam's site, but here are some of my favorites. Notch of Minecraft fame probably needs little in the way of introduction. 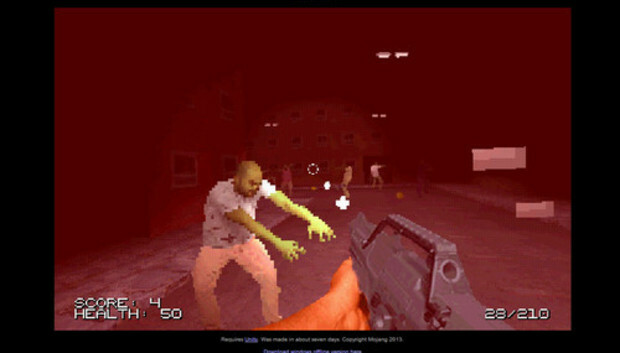 His contribution, dubbed Shambles, is a zombie shooter (groan) with a bit of a twist: weapons and ammunition can only be picked up off of the corpses of police officers, and health can only be picked up off of the corpses of civilians. While you're blasting away undead hordes and picking up little point baubles, you'll have a hefty decision to make: do you hunt down your fellow man, making yourself little better than your braindead foes? I never actually got the urge to get all Lord of the Flies on my fellow man; the zombies are pretty efficient killing machines in their own right, and I could simply scoop up the gear left in their wake. The cops will also fire back if you attack them, which might make your pursuit of arms a bit less profitable. Your own mileage / bloodlust may vary: check out Shambles at Notch's site or its 7DFPS page. I took an archery class my first semester of college, and absolutely loved it. There's just something majestic about wielding one of mankind's oldest weapons and doing abstract violence to paper targets a hundred yards away. Probably Archery is reminiscent of that experience. Specifically, attempting to wield a bow in the early hours of the morning with the requisite college-freshman hangover. It's inspired by QWOP and Surgeon Simulator 2013, so you can probably already tell where this is going. Use a combination of your mouse and keyboard to manipulate your limbs, and plant an arrow in the target. Or flail majestically, which is about all I could manage. A sweeping soundtrack (one song, really) is bolstered by a multiplayer mode, and there's even a video tutorial that should help you be a little less terrible than I am. Check out Probably Archery at it's 7DFPS page. This one is reminiscent of Portal and The Swapper--both excellent games--but quite unlike either one; I realize that doesn't make much sense. Hit the left mouse button to fire a clone, and hit the right mouse button to fire a shot that deletes said clone. It's a puzzler, with challenges centered around positing your clones in the right space to trigger moving platforms and the like. It's also a bit rough around the edges (as befitting a game made in seven days), so actually placing clones can be a case of trial and error. I do love the camera concept: your browser window is divided up into four viewports, with your allotted three clones serving up their own unique perspective. I do hope the developer takes this one further still, as it's a brilliant idea and already loads of fun. Check out Dopplegunner at its 7DFPS page.